Low carb eggnog cheesecake bars with a gingersnap crust and topped with rich gingerbread whipped cream. This post is sponsored by Safest Choice Eggs as part of their Eggnog Party. It’s a very noggy time of year and I for one intend to take full advantage of it. I know eggnog is not everyone’s cup of tea (or cup of nog) but I love the stuff. And I know I am not alone. Eggnog recipes abound right now, not just for the actual drink but for the various treats and goodies you can make with it. Even if you don’t like it on its own, chances are you do have a hankering for some eggnog baked goods. And you should feel free to indulge because eggnog is very easily made low carb. Of course, they don’t carry ayd sugar-free versions at your local grocery store, but homemade nog is a cinch. It doesn’t take more than half an hour to whip up a batch and then you can drink it with impunity. Or just use it in your favourite recipes. I think the idea of homemade eggnog scares a lot of people, but it really shouldn’t. 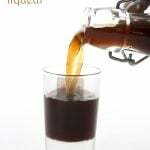 You have a couple of options to make sure it’s a safe, healthy drink for all ages. The first option is the cooking method, which means gently heating it to about 180F to kill all the bacteria. This does require a bit of standing and stirring and watching to make sure your eggs don’t curdle and become scrambled, but it works well. I came up with a low carb eggnog a few years back that uses almond milk and heavy cream to keep the carbs down. It’s delicious and even the most discerning palate wouldn’t know that it’s sugar-free. Your other option is to use pasteurized eggs and I highly recommend Safest Choice pasteurized shell eggs. They have a great Classic Eggnog recipe on their site that only needs a few minor tweaks to make it low carb. Just swap in your favourite sweetener for the sugar (Swerve works like a charm) and use unsweetened almond milk in place of the whole milk. Their recipe makes a LOT of nog, so if you aren’t hosting a holiday party, I recommend cutting the recipe in half. I scaled the recipe back when I made my Eggnog Creme Brulee a few years ago. One little tip: make sure your egg whites are at room temperature before beating them. I’ve learned that the pasteurized egg whites won’t whip properly when cold. If you don’t want to bother making eggnog at all, there is always eggnog flavouring. My husband bought me a dram of Lorann Oils eggnog flavour a few years ago and I decided to try it out in these Low Carb Eggnog Cheesecake Bars. I used a little eggnog itself in the filling but I couldn’t use too much lest the cheesecake not set properly. Since I love eggnog, I figured I would intensify it a little more with the eggnog flavouring. The results were delicious, and even my kids loved it. If you can’t get your hands on eggnog flavour, I recommend adding some rum extract and/or a little extra nutmeg to get that true holiday eggnog experience. Safest Choice is also hosting a wonderful holiday giveaway. Check out the details below! Two baking prize packs valued at $500 each! Two (2) Grand Prizes: consisting of one (1) $200 Amex gift card, one (1) Sur La Table® Platinum Professional Bakeware, 7-Piece Set, and one (1) Sur La Table® Silicone Snowman Spatulas, Set of 2, One (1) Better Homes and Gardens Baking: More than 350 Recipes Plus Tips and Techniques cookbook, and 52 coupons for a free dozen of Davidson’s Safest Choice® Eggs; Approximate Retail Value (“ARV”): $501.96 each. Check out all the other great recipes made with eggnog here! Low carb eggnog cheesecake bars with a gingersnap crust and topped with rich gingerbread whipped cream. Preheat oven to 325F. In bottom of an 8x8 square baking pan, combine almond flour, sweetener, coconut flour, cinnamon, ginger, clove and salt. Add melted butter and stir together until mixture begins to clump together. Press firmly and evenly into the bottom of the pan. Bake crust 10 to 12 minutes or until just beginning to brown around the edges. Remove and let cool. Beat cream cheese with sweetener until well combined and fluffy. Beat in eggs, eggnog, flavouring and nutmeg until well combined and smooth. Pour filling over cooled crust. Bake 35 to 40 minutes or until just set. Remove and let cool, then refrigerate at least 3 hours. 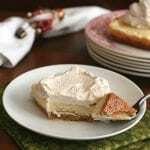 For the gingerbread whipped cream, combine whipping cream, powdered sweetener, molasses, cinnamon and ginger in large bowl. Beat until medium stiff peaks form, but do not overbeat. 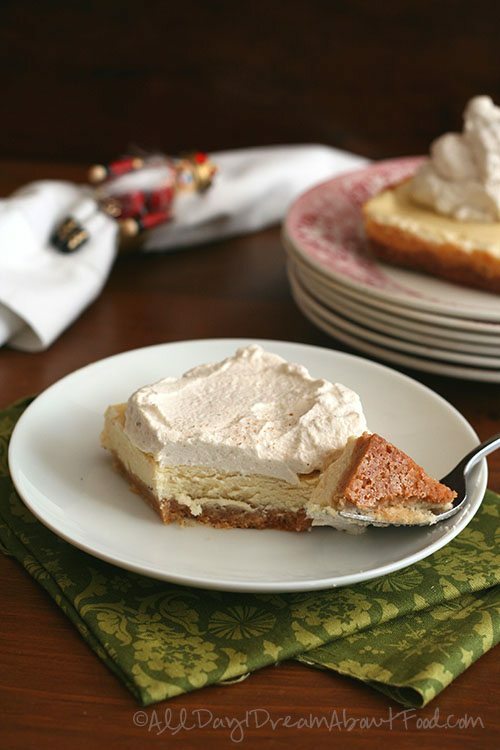 Cut cheesecake into squares and serve with a dollop of gingerbread whipped cream. Serves 16. Per serving: 254 Calories; 24g Fat (83.8% calories from fat); 6g Protein; 5g Carbohydrate; 2g Dietary Fiber; 101mg Cholesterol; 168mg Sodium. Total NET CARBS = 3 g.
Disclosure: I was compensated for this post by Safest Choice Eggs. As always, all opinions, thoughts, recipes, photography, random tangents and incoherent ramblings are my own. I love eggnog! 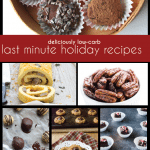 I will be trying your low carb recipe this yr.. yay! I usually do not drink eggnog, but these eggnog cheesecake bars look amazing! This sounds delicious. I’d like to try those eggs, but I’ve never seen them in the stores I visit. I may have to check out grocery stores in other areas of town. I like eggnog in drinks, but this recipe sounds intriguing! I can not wait to try this recipe. I love egg nh!! I love eggnog in my coffee! Holy Moly these look amazing!!!! I can’t think of a better way to enjoy eggnog than to make these ASAP!!!! Pinning! I don’t particularly like molasses flavor, but love the color it gives to my gingerbread flavored items. 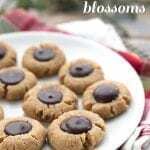 Do you know of another way to achieve a similar color without molasses? There are certainly natural colours, like annato but I don’t use them so I couldn’t give you much advice there. I’ve never tried egg nog, but my fiance loves it. Perhaps with your options I will try now. Either way, I have different ways to fix it for him this year! 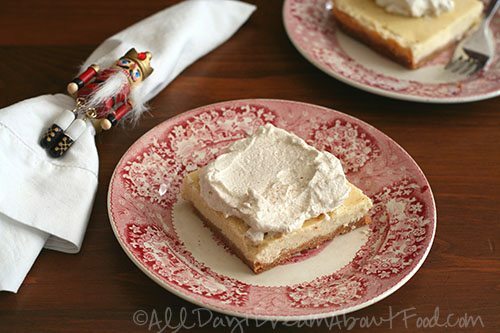 I recently made eggnog cheesecake bars too, and I love the gingerbread whipped cream you added on top! My favorite way to enjoy eggnog is in oatmeal. Is the crust Gluten free, and kosher? It contains no leaving agents. It’s certainly gluten-free. Kosher, I am a little less certain about but yes, it doesn’t contain any leavening agents and the almond flour is kosher, that I know. Eggnog and cheesecake, how can you go wrong!! Yummy, good thing I have a snow day today!! What a holiday treat with eggnog and gingerbread flavors in one! I love eggnog everything, especially by itself, or eggnog coffee creamer! I would totally snog these noggy treats. I’m a nog lover to the core, and I love that I can skip tempering with Safest Choice eggs too! Hmmm, I ‘ve never made my own eggnog but I may like it more knowing there isn’t as much sugar and fat in it! Great recipe for Safest Choice eggs. I’m not much of an eggnog drinker normally, but these look delicious and I’m sure my mom will love them! Thanks for the chance to win this giveaway. I have never tried eggnog before but that recipe looks great. So excited to try this recipe. Another great looking recipe. This one sounds delicious. You always inspire me to use you recipe as a start and to tweak it to my flavor preferences. I think amaretto/almond flavoring would be good using this recipe as a base. Thank you! Is evap cane juice in granulated form? As long as it’s not liquid, your fine. Liquid forms would through off the liquid content and you may end up with something that won’t set. Yes, it’s granulated 🙂 Thanks! That’s what I thought. I had half a mind to try it with raw honey but I don’t want to mess with adjusting it that much. I can’t wait to try it!! With a dash of nutmeg. How do you come up with such great recipes? Love you dense pecan pie chocolate chop muffins. my favorite way to enjoy it is straight-up! on christmas morning with the fam! this looks amazing…I’ve always been afraid to try eggnog, but I’m making this now!!! My favorite way to enjoy eggnog…. hmm, is there a bad way? I think not! I love a good a glass of plain old eggnog. Thanks for the giveaway! I’ve never made eggnog bars of any kind these look beautiful and sound yummy! I love these, Carolyn! I’m not big into drinking eggnog, but it’s great to bake with! Just drinking it is my favorite!! 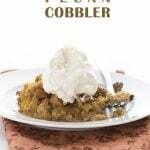 Love these recipes – thank you for sharing them!!! I like to make no-sugar eggnog protein shakes! Yum! I like to warm it up in a mug and add a tablespoon or two of spiced rum….topped with whipped cream and nutmeg….yum! 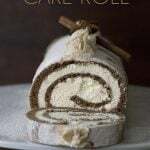 I haven’t had a lot of experience with eggnog but these recipes look great! My son and I LOVE your brownie cheesecake recipe, so I am going to have to give this one a try. I am hosting a party on Sunday night, so this might have to be served. You gave me hope that a diabetic type 2 can eat great tasting desserts and keep down blood sugar levels. Thank you!! You are an AWESOME Baker. I am finding it difficult to find ingredients at times. Who carries unsweetened coconut? I love egg nog and have avoided it, until now! I’ll be making these! I love it anyway you can fix it!!! I can’t wait to try some of these eggnog recipes. It’s exciting that I don’t have to go “without” my nog this year!!! 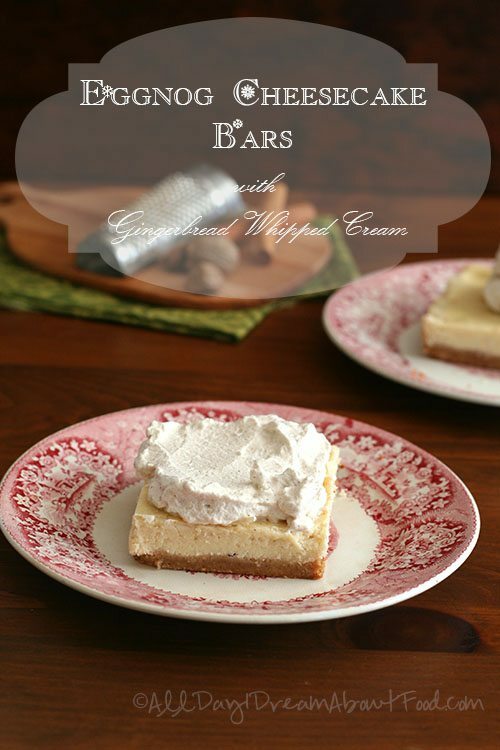 Love the gingerbread whipped cream on these bars! 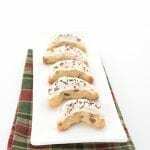 I loved finding ways to sneak eggnog into my baked goods this time of year! Carolyn, I am a huge fan! I have made many of your recipes and every one is a winner! I cannot wait to try these bars. I will have to leave out the ginger as my daughter is allergic to it. Any suggestions? Allspice instead? My favorite way to enjoy eggnog is just SIPPING it!! Thanks for all you do for us low-carbers – really enjoy your recipes. Faith. I love eggnog every and any way! My favorite way to have eggnog is with a shot of rum and some whipped cream on top! My husband loves eggnog. I can’t wait to try your recipe. Thanks. I’m all about the crust in cheesecake, and yours looks like a fabulous crust:cheesecake ratio in bar form. Love this. I love low carb bar recipes. I love eggnog candy and I love to drink it but until now I thought I had to give it up being low carb. I love eggnog when its flavored a little with peppermint or gingerbread or pumpkin. I love your eggnog recipe and will be using it to make these squares. Thanks for the opportunity to win this giveaway. Merry Christmas and Happy New Year to you and yours. Thanks again. My favorite way to enjoy egg nog would be to incorporate into pancakes! I really enjoy eggnog and am so glad to know of the low carb, low sugar version. I’ve seen several recipes using eggnog but didn’t know of your recipe for the eggnog itself that I could use in them. 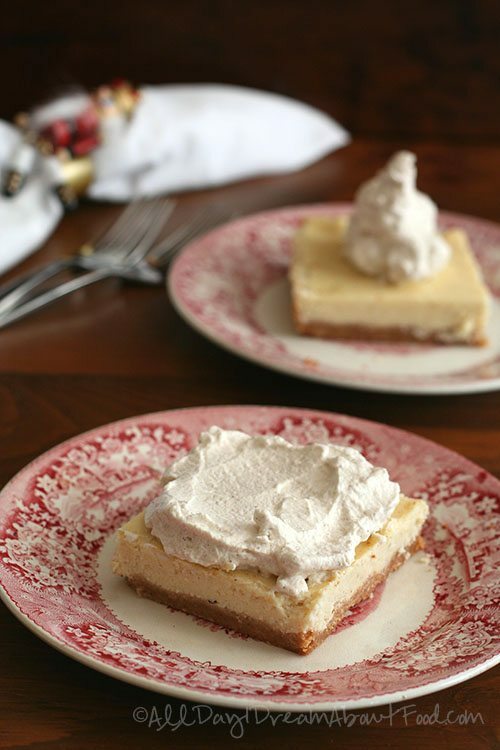 I definitely will be making Eggnog Cheesebars with Gingerbread Whipped Cream…sounds yummy! Thank you for your great recipes and blog! 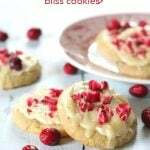 I love eggnog flavored Christmas cookies! I like eggnog in coffee. These bars are going on the list of things to make for the holidays. I love eggnog to drink. I want to make the eggnog cheesecake bars now though. 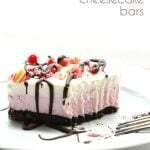 These cheesecake bars look delicious! 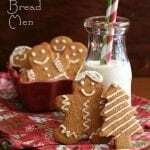 I love using eggnog in recipes during the holidays….my favorite recipe is for Eggnog Bavarian. My favorite is to drink it straight!! You never cease to amaze me with the wonderful creations that come out of your kitchen. I love eggnog and will have to try this recipe out this soon! I usually use my left over eggnog to make low carb waffles , love eggnog spiked or not, its one of those must have’s for the holiday. My favorite way to enjoy eggnog is spiked with a dash of rum! Just wanted to come back and let you know how it turned out: I made this yesterday and everyone went CRAZY over it!! I don’t think anyone would have known it was gluten free, and I wouldn’t have either if I didn’t make it. The crust texture is PERFECT! I did use organic cane sugar (evaporated cane juice) instead of Swerve, and I decreased it by 1/4 in the filling because I tend to like a tangier cheesecake than most recipes make, but it turned out just right! I also used store bought eggnog (regular, not sugar free) and that worked just fine too. Maybe next time I’ll get ambitious and make the eggnog myself 😉 The whipped cream was a huge hit, I think I definitely need to make a double or triple batch next time because my relatives were tripping over each other to get the last few spoon fulls! Thank you for this fantastic recipe, it will definitely be my go-to for this time of year, and the crust is going to be my new standard for GF cheesecake! Sounds like it worked out so well! If we aren’t using egg nog, do we need to add even more of the eggnog extract? maybe 1 tsp instead of just 1/2 tsp? Yes, that would probably be about right. I made it with the 1 tsp eggnog flavoring and the other instructions for making without eggnog and it was AMAZING!!! 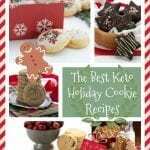 Everyone at our Christmas party loved it and I even sent some people the link to your recipe. No one could believe it was low carb. I will definitely be making this again!